Nottingham City Council has issued Eric Pickles’ department with an enforcement notice over an “unkempt” building it owns. Lancaster House on Sherwood Rise, owned by the Department for Communities and Local Government, is currently empty. 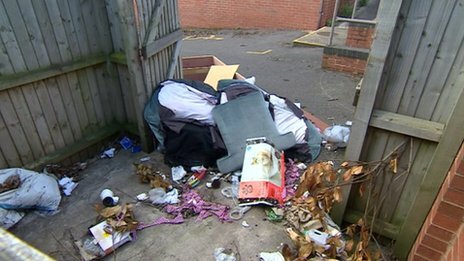 The Labour-run city council said residents had complained about vermin due to rubbish left on the site. Eric Pickles will not comment on the matter until the DCLG receives the paperwork, expected after Easter. BBC East Midlands’ political editor John Hess said that even when Mr Pickles sees the paperwork, he was “likely to dismiss it as a political stunt”. A Section 215 notice has been sent to the DCLG, which gives the local authority the power to deal with property that is “detrimental to the amenities of the neighbourhood”. It gives the DCLG seven days to clean up the property or face a bill for the council having to complete the work on its behalf. Nottingham city councillor Sam Webster said: “I hope Mr Pickles is here this weekend and cleans some black bags out himself but I can’t see that happening. It is estimated it will cost about £1,000 to clean up the site.